Most likely in the last year you have heard of at least one disease event caused by a pathogen “spillover” from animals to humans. I would even venture if you have not heard of any zoonotic disease, you probably live in a bunker in Indiana. Coverage of these disease events has increased greatly in recent years as the frequency and types of human and animal intersections continue to escalate. Zoonotic diseases—those infectious diseases shared between human and non-human animals—are often significant and costly, in both the loss of human lives and impacts to the global economy. There are so many zoonoses that I could spend the rest of this blog playing “name that zoonotic disease” as I write out the 1,600 or so diseases that humans share with animals: many of which are emerging within human populations. I might start the list with diseases like avian influenza and swine flu. Then I could mention the zoonotic viruses Ebola and monkeypox. These two viruses are extremely important, but for some reason feel exotic to people in the United States, even though people have tested positive to both while on US soil. One person even died of Ebola in a hospital in Texas in 2014. I might then list the oldest known zoonotic disease—rabies—and consider the fear it instills with the recent reminder following the tragic rabies related death of a child in Florida. Other zoonoses on the list may include West Nile virus, Sudden Acute Respiratory Syndrome (SARS), Middle Eastern Respiratory Syndrome (MERS), Zika virus, Q fever, and toxoplasmosis. The list would go on and on. In our globally connected world, any one of these diseases could show up anywhere on the planet, from Alabama to Zimbabwe. The often-cited statistics that 75% of human emerging infectious diseases (EIDs) are zoonotic and that 70% of these have a wildlife reservoir should be of interest to anyone that cares about human health. But, what about the other side of the equation? Do animals get infected with pathogens transmitted from people? The simple answer is yes. Humans can and do transmit pathogens to non-human animals. Some call these diseases anthropozoonoses to reflect the human (anthro) to animal (zoonosis) direction of the transmission. However, I am much more comfortable to call these diseases zoonoses. The term zoonotic should include the diseases from non-human animals to humans AND from humans to non-human animals. Zoonoses may be bi-directional. However, even with all the current news on human EIDs and their zoonotic link, we rarely hear about pathogens that humans transmit to non-human animals. In a recent study (http://rdcu.be/FqQx ), we looked at the other side of the zoonoses equation and sought to determine if humans transmit pathogens to our great ape relatives. In the paper entitled “Pathogen Transmission From Humans to Great Apes is a Growing Threat to Primate Conservation” we provide data from a meta-analysis (a review!) of the scientific literature on great ape infectious diseases acquired from humans. We looked at great apes living in captivity, semi-free living conditions (such as great apes habituated for ecotourism) and free-living. We found 33 individual occurrences of probable or conﬁrmed pathogen transmission from humans to great apes during the period 1964-2012. Occurrences were found in great apes in captive (n = 7), semi-free-living (n = 25), and free-living (n = 3) conditions, with two occurrences affecting populations in both semi-free-living and free living conditions. The majority of occurrences involved chimpanzees (Pan troglodytes) (n = 23) and mountain gorillas (Gorilla beringei beringei) (n = 8). This may reflect a larger amount of research with these species or possibly higher human to chimp and human to mountain gorilla contact. One thing is for sure, these 33 events are just the tip of the iceberg since we know many disease events in great apes go undocumented and never reach the scientific literature. For example, I am personally aware of two zoonotic disease outbreaks: chickenpox from a keeper to gorillas in a zoo in the U.K. and polio in chimps at a zoo in the Republic of Congo. You will not find either of these events reported in the literature, but there is no doubt that both were caused by human to non-human great ape pathogen transmission. How many more stories like this are out there? Six great ape species are endangered or critically endangered as determined by the International Union for the Conservation of Nature (IUCN). All six are experiencing decreasing population trends. (In fact, Homo sapiens [yes - us!] is the only species of the seven within the Hominidae family that is having population increases and is not endangered.) 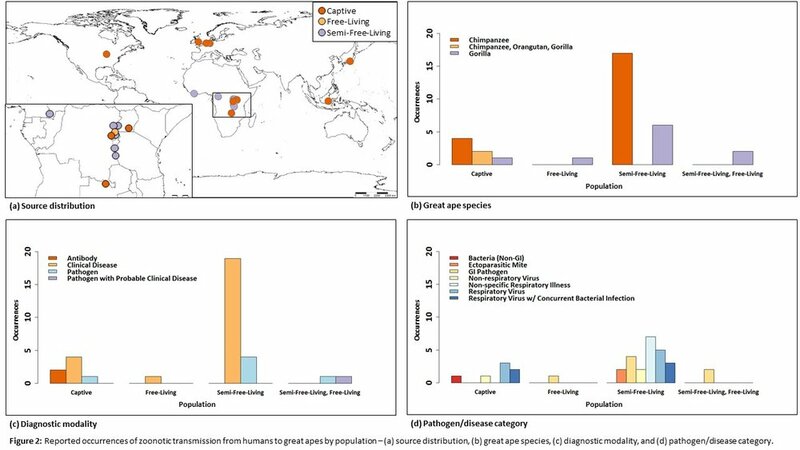 Our review shows that zoonotic pathogens transmitted from humans to our non-human Hominidae relatives may be a significant, but unappreciated, issue. We must work to better understand these zoonoses if we are to prevent human caused disease events from further threatening our closest living relatives.